pricey if you move around a lot. When to go: October – May. If you’re able to travel outside of the rainy season (which is in the months May through October) this is probably best. Nevertheless, the rainy season is not as bad as it sounds; it’ll rain for about an hour every afternoon/evening. 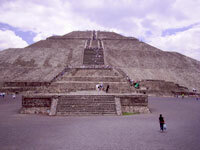 What’s described in this guide is only a small selection of what Mexico has to offer. The ultimate guide to this country does not exist: the country is absolutely enormous (it would take you about three days of non-stop travel by bus to cross the country from Baja California to Yucatán Peninsula) and is home to a rich variety of attractions: deserts, beautiful coast lines, one of the biggest cities in the world, Indian ruins, holiday resorts, local festivals, a colourful cultural heritage… All of this diversity makes Mexico a popular destination with travellers of all sorts. metropolis is absolutely huge, it is in fact the third biggest city in the world. Mexico. The nightlife is best in Zona Rosa. - apart from the obligatory Kodak moments – some great views over the entire site. the ancient society that once dwelled here. will without a doubt discover plenty of great spots to hang. of days. The beaches are beautiful, although the Playa Municipal is quite dirty. 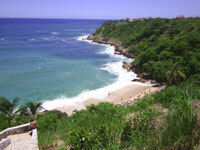 along the bay’s shore or by boat, and is an excellent spot for some snorkelling. the Black Bull for some dancing. Once a small attractive fishing village, nowadays a lively backpackers’ hub. in the evenings. These gatherings can end in beach parties, great fun. or lunch. Mercado Benito Juárez has a little bit of everything. made out of cactus; you drink it in shots much like tequila). 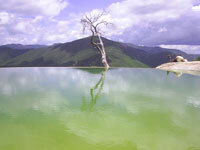 pools to swim in, and some amazing views to marvel at. 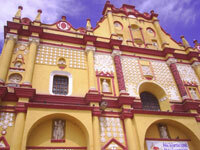 The surroundings of San Cristóbal have a lot to offer, and make great day trips. and should not be missed. Agua Azul is a series of impressive waterfalls and rapids. sort of town between Palenque town and the ruins. high canyon. You’ll see crocodiles and howler monkeys if you’re lucky. Quite impressive. surroundings and/or visiting the lovely nearby villages. and you won’t lose a day to spend on more interesting things. Mexicans eat chili on everything, and loads of it. Be prepared. It’s useful to have some basic knowledge of Spanish before arriving into Mexico.